Our top pick for the best air quality monitor is the Awair Air Quality Monitor, a popular and respected device. We settled on this unit because of its versatility. It tracks most air pollutants except for carbon monoxide. Metrics monitored include carbon dioxide, dust, toxins, chemicals, humidity, and temperature. You can also use it with both Apple and Android devices. For our step-up pick, we chose the Blueair Aware Indoor Air Quality Monitor. The Blueair Aware tracks the following air quality factors: VOCs, carbon dioxide, temperature, particulate matter and humidity. It also has a helpful app which ensures you get data directly on your phone in real time. 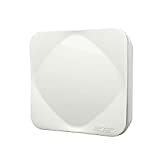 Our budget pick is the Gain Express AZ Instruments Wall Mountable Indoor Air Quality Monitor. 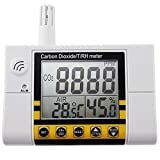 It is one of the best at monitoring carbon dioxide levels in the environment. It also covers temperature and humidity. Many people are not aware of the importance of monitoring their indoor environment air quality. You may not know it, but poor air quality has a negative effect on your energy levels, your sleep, and can cause the symptoms of cold such as sniffles and watery eyes. If you are asthmatic or suffer from respiratory allergies, the issue becomes even more critical. In the event of high radon concentration in your environment, you might even get lung cancer. That sounds scary, right? We are not trying to scare you. These are the facts. We no longer live in the old days when forests were untamed, where we built our abodes close to nature and the air we breathed was clean and healthful. Times have changed, and the best we can do is to adapt in order to survive. One of the ways of doing this is by getting yourself an air quality monitor. The quality of indoor air can deteriorate due to a variety of factors and activities. For instance, cooking introduces smoke and other particulate matter. Cleaning and DIY hobbies may introduce VOCs (volatile organic chemicals) into what you breathe. You can also get VOCs from furniture and home building materials. When you shut the door at home, you may not realize it, but you are unwittingly sealing in carbon dioxide, which you inhale. Another danger is carbon monoxide, a deadly gas which comes from wood-fueled heaters and furnaces. Air quality monitors will keep track of all these factors, alerting you when levels are too high, and giving you advice on tips on how to improve the quality of what you breathe. Most of them also monitor temperature and humidity. Humidity facilitates the breeding of mold. Radon is a radioactive gas that occurs naturally, and has no color, smell or taste. The gas occurs naturally outdoors in benign amounts. Radon forms due to the breakdown of uranium in rocks and soil, and comes into buildings from the soil through the building’s lowest level. Concentrations of radon may build up in your home if the ground beneath has natural uranium deposits. It can therefore be found in indoor environments such as homes, workplaces, and schools. Radon gets into your home through cracks in the floors or walls. It may also enter through construction joints or gaps in foundations around pumps, wires and pipes. As you would expect, the levels of the gas are highest in basements, cellars and any other places that are in direct contact with soil. Radon may also be present in water. This poses a problem mostly in places or countries where people obtain their drinking water from groundwater sources like wells, springs, and boreholes. Groundwater sources tend to have higher concentrations of the gas than surface waters such as lakes, rivers, and reservoirs. When radon escapes from the ground and gets into the air, it undergoes decay, which produces further radioactive particles. We breathe these particles, and they are deposited on the cells lining our bodies’ airways. As a result, DNA damage and lung cancer may occur. If you have never heard of radon, it will come as a shock to you that it is the leading cause of lung cancer among people who don’t smoke. It is the second leading cause of lung cancer, with smoking being the first. According to the EPA (US Environmental Protection Agency), the gas causes 21,000 lung cancer deaths every year. 2,900 of these deaths are among non-smokers. As you can see from these figures, smokers are still more vulnerable to lung cancer via radon than non-smokers. Estimates are that people who smoke are 25 times more at risk from this gas than people who don’t smoke. The concentrations of radon will vary between homes, and even in the same home, they will vary from day to day and hour to hour. Fortunately, you can measure your home or office’s radon levels in a simple, inexpensive way, and that is by purchasing a device that can detect radon. Increasing the ventilation within your home. Seal the floors and walls of your home. Put in a radon sump system in your basement or under a solid floor. We were particularly drawn to devices that track multiple air quality factors. By that we mean monitoring VOCs, particulate matter, carbon dioxide, carbon monoxide, humidity, temperature, asbestos-containing materials. The best devices, we felt, are those which are more versatile. We were interested in devices that could connect to other devices or technology via Bluetooth, Wi-Fi, and so on. The best units have more options for connectivity. We were biased towards devices that are compatible with multiple devices. The best devices to us were those that were compatible with more than one operating system – both Android and iOS. We paid more attention to devices that were easy to operate. Users are looking for something with an intuitive user interface. The information they give us should also be easy to understand, whether in form of graphs or color-coded notifications. The best devices should be easy to use. Our best device is the Awair Air Quality Monitor. It monitors the levels of toxins and chemicals, carbon dioxide, dust, humidity, and temperature. The air monitor is constructed using natural materials such as North American walnut timber. The wood gives it a unique, classical look that will look good wherever you install it in your home. The device can connect with Alexa, Nest, and IFTTT. It also works with tablets or smartphones that support Bluetooth 4.0, and run iOS 8 or later and Android 4.3 or later. The device gives actionable insights and personalized tips to help you improve the quality of what you breathe every day in your home. It gives you a score ranging between 0 and 100 to alert you of the air quality. Thanks to this unit, you can get the best quality of sleep, increase your productivity, control your allergies and generally ensure you have the best health. The insights and tips it provides depend on your preferences. For instance, if you care more about quality of sleep than allergies, it will give you information that is useful to you along those lines. It also works well with air purifiers. The one major thing tracked by most units that it does not monitor is carbon monoxide. It also does not monitor radon, but then neither do most devices. Our step up pick is the Blueair Aware Indoor Air Quality Monitor, which we loved for its versatility. It monitors particulate matter, VOCs, temperature, humidity, and carbon dioxide. It has an app called the Blue Friend App which does this monitoring. The app sends and stores data every five minutes. 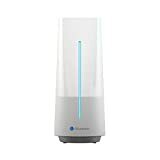 The device will track the airborne particles in your home wirelessly, and send the data directly to your phone in real time via the Blue Friend App. It is compatible with iPhones using iOS 8 and later, and smartphones using Android 4.1 and later. It also has Wi-Fi connectivity. 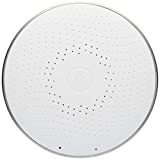 If you are looking for the best air quality monitor at affordable price, your best option is the Gain Express AZ Instruments Wall Mountable, one of our favorite indoor air quality monitors. The device monitors carbon dioxide, temperature, and humidity. This device is the one of the best for places that normally have high levels of carbon dioxide. These include greenhouses, factories, hospitals, hotels, schools, and office buildings. It is intuitively easy to use, and you can pretty much start using it without having to read through every single thing in the operation manual. The device has four buttons that help you customize the metrics and defaults. You can connect it to the computer whenever you wish to import the collected data for storage and analysis. Our best monitor for people who suffer from various allergies is the Dylos DC1100 Pro. It is particularly useful for people who are allergic to pollen. It is unique and different from other units in the list because it is actually a laser particle counter. As the name suggests, its main task is to monitor particles. The best thing about it is that it can see air pollutants and small particles which other monitors may miss. It can see them in two size ranges: large (at 2.5+ microns) and small (between 0.5 and 2.5 microns). This ability to view such miniscule particles gives it an edge over other monitors, making it the best for detecting mold and bacteria. The large range is ideal for pollen. For this reason, the Dylos DC1100 is the best monitor for people who have respiratory conditions. It comes highly recommended if you have asthma or allergies. The Dylos DC1100 has a sparse design. Using it is intuitive and easy to use. It displays the number of particles in the air according to the average amount detected in the last 10 seconds. This ensures you get a close-to-accurate yet steady reading; otherwise the numbers would fluctuate so quickly that you would not complete reading them before they change again. 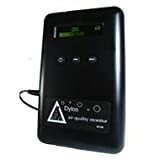 The device displays two numbers on its LCD screen to show the readings – one for the large particles above 2.5 microns, and the other for smaller particles between 0.5 and 2.5 microns. The former is the main number, and displays on the right, whilst the latter displays on the left. The larger number is for particles that may potentially cause irritation to your lungs, whilst the smaller number is for particles that may potentially cause health problems if you inhale them. The device has three buttons that enable you to switch between the different kinds of information being displayed on the screen. For instance, by pressing the “mode” button, you get to switch between real time monitoring and historical data. It has different modes for providing data by the minute, hour, and day. The device can display up to 30 days of your home’s air quality history. Some of the best units go beyond tracking the quality of what you breathe. They also have air sensors to monitor your indoor climate and is an excellent temperature and humidity monitor. Our best device in this category is the Netatmo Healthy Home Coach, Smart Indoor Climate Monitor. When the air is too dry, you can get itchy skin. When it is too humid, mold will start to grow in your home. Managing humidity levels is also crucial for dealing with asthma and allergies. Monitoring temperature is especially critical if you have a toddler in your house. Babies cannot yet balance their body temperature properly. A room may feel okay to you yet be too hot for a toddler, causing them to sweat heavily. With the Netatmo Healthy Home Coach, you will be able to monitor the indoor room temperature and ensure that it is at the right levels for your baby. In addition to these, it also monitors the noise levels in your home at ranges between 35 dB and 120 dB. The Netatmo Healthy Home Coach comes with an app which has three profiles: the general profile, a baby profile, and a profile for someone who has asthma. The app sends real time notifications to your smartphone. For iPhone, iPad, or iPod users, it requires iOS 9.0 or later. If you are using an Android device, it will require Android 4.2 or later. You can connect multiple Healthy Home Coaches to you smartphone so as to monitor more than one room. One of the best features on the Netatmo Weather Station is that it gives you useful advice on how to create a healthier environment for you and your family. For instance, if your child has asthma, it will let you know which humidity level is best, highlighting when potential problems crop up and giving you tips on how to fix them. 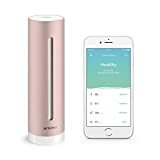 Our best air quality monitor for radon detection is the Airthings Wave Smart Radon Detector, which comes with a free app, no lab fees, uses a battery, and is easy to operate. Radon is the leading cause of lung cancer among people who don’t smoke. The other scary thing about radon is that it doesn’t have a smell, color, or taste. That’s why you need an air quality monitor with sensors that have radon detection capabilities. The gas goes through daily fluctuations, and as a result requires constant monitoring to ensure the negative health effects are at a minimum. That’s precisely why this Airthings unit is the best in this category. It comes with a free app which enables you to access readings on your phone about the levels of radon gas in your environment. It also monitors the temperature and humidity. When radon levels rise, you will receive notifications on your smartphone. You will also receive notifications when the battery is running low. The unit has a long battery life of about 1.5 years. In the event of high radon levels, it can also send you notifications via email or IFTTT. The best thing is the device’s simple and intuitive way of communicating information. It uses color codes. When you get green, it means that air quality is good and radon levels low. Yellow is a warning – open a window. Red is danger territory – air quality is bad and the radon levels are too high. To get these color-coded notifications, all you have to do is wave in front of the detector. 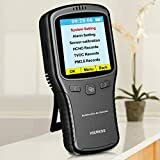 Other fantastic features of the device include easy installation, easy removal for battery replacement, audio alerts for when radon levels are high, and a detector that automatically calibrates to its environment (thus enhancing its accuracy). For an air quality monitor that is easy to take with you wherever you go, your best bet would be the Igeress Indoor Air Quality Detector. You can use it at home, in your office, in the car, for traveling, or camping, and so on. Its sensors will test the air quality of any environment. For portability, it has a power adapter with USB cable for charging. It will accurately detect formaldehyde, TVOC (total volatile organic compounds – including benzene), and fine particulate dust matter that measure PM2.5 (have a diameter of less than 2.5 micrometers/microns). It carries out real time testing, recording and analyzing, and has a smart real time display to show readings. The LCD color screen intelligently displays the results of testing in English. It is easy to read and understand the information. The device is also easy to use, having simple system settings and three function buttons. Do you love everything tech, gadgets, and so on? If you do, we believe the Acer Indoor Monitor is the best device for you. It is a made-in-Taiwan gizmo which monitors six critical air quality indexes with its sensors: carbon dioxide, TVOC (total volatile organic compounds), PM2.5, PM10, humidity, and temperature. It comes with LED-lighting indicators which display five different air quality status that correspond to the AQI standard. There is a subtle circular LED light which enables you to see what the current air quality standards are, displaying the information using different colors to signify varying degrees of quality. It also ensures that you can sleep without getting distracted. It has an integrated air quality sensor which will automatically turn this light off when it notices that you have dimmed ambient light to a certain level. If you love tech, then you probably have several devices using different operating systems and protocols. You will love this monitor since it can connect with Amazon Alexa, IFTTT, Bluetooth and Wi-Fi. It provides real-time data which you can access in real time using a dedicated smartphone app, and see time-weighted average data points from practically anywhere in the world so long as you can get internet. When the indicators exceed the predefined thresholds, you will receive warnings in the form of push notifications. You can also do a historical tracking of the data by day, week, or month, which will give you insights to take relevant action to improve the quality of what you breathe. The unit is highly portable, so you can take it with you wherever you want since it has an embedded battery. When the battery is at full charge, the monitor will work for up to 12 hours. 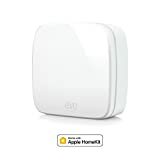 For the best wireless indoor sensor, look no further than the Elgato Eve Room Wireless Indoor Sensor which has Apple HomeKit technology. This indoor sensor has most of the qualities you need in an air quality monitor. It senses indoor air quality (IAQ), humidity, and temperatures. With this IAQ monitor, a sophisticated sensor powers the Elgato Eve Room, enabling it to analyze volatile organic compounds (VOCs). Going beyond carbon dioxide, which is standard, it monitors these substances that have a direct effect on your health and wellbeing. The Elgato Eve Room is compatible with Apple products – iPhone, iPad, or iPod touch. The devices must have iOS 10.3 or later. As we have mentioned above, it is a HomeKit-enabled device. As a result, you can rely on extreme ease of use and advanced security. HomeKit is a home automation platform that belongs to Apple. The platform is used to control smart home products (such as Elgato Eve Room) with iOS apps and Siri voice commands. It also works well with Siri, Apple’s intelligent voice-controlled personal assistant. If you want to know the temperature and humidity levels, all you have to do is ask. At a glance, you can learn every relevant thing about your home thanks to the graphs the monitor generates. The graphs will give you data by day, month, or year. You will also get insights on how to make your home environment more comfortable and healthier. It has Bluetooth low energy technology, enabling a truly wireless operation since it uses long-lasting, replaceable batteries. You won’t have to deal with power cords when using this unit. This convenience adds luster to the device’s elegance. Speaking of elegance, the monitor has a flawless design which makes it seamlessly blend in homes or offices. 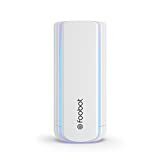 Our pick for best home device to monitor the quality of the air you breathe is the Foobot Indoor Air Quality Monitoring System. Setting it up is easy. It should take you two to five minutes, and then you can start receiving data on your phone. Additionally, the Foobot is easy to use. You not have to plough through several pages of the manual for you to use it. All you have to do is plug it in, download its app, sync your phone with the Foobot, and you can start receiving the data. It works with both iOS and Android. The app is available on both operating systems. The colored LEDs will instantly alert you about the quality of the air you breathe in your home. You can dim the LED lights during your bedtime. You can also connect the device to home automation devices wirelessly via IFTTT, Stringify, or Artick Cloud. The device has sensors for VOCs (chemicals), PM2.5 (particulate matter), temperature, and humidity. Airboxlab, the startup that makes this device, runs many tests to compare it to reference lab devices (it is not a lab device, but rather a home device). This accounts for higher accuracy in comparison to other home devices. Foobot’s sensors do not begin to give accurate readings until after six days. That’s because of the mini plastic foil wrapped around the sensors when you take the device out of its box. That’s hardly a deal-breaker, though, considering the high accuracy you get from the Foobot after those six days have elapsed. Another flaw is that the device lacks a carbon dioxide sensor. However, note that carbon dioxide is a naturally occurring gas exhaled by humans. Monitoring VOCs and particulates is more important to indoor air quality. There is a wide range of air quality monitors in the market, and therefore, coming up with this list was no small task. However, the products featured within the list are the best in their respective categories. In competition are several other good products. The main factor that prevented most units from appearing in our list of the best is lack of versatility. For instance, some may measure only one or two aspects of air quality. Clearly, such devices are not very useful. Other factors that kept some products from making it into this best list include poor connectivity and inaccurate readings. Q: What are some things I can do to ensure I have the best quality of air in my home? Keep the windows open as often as possible. Ensure you change or clean the filters of appliances in your house regularly. We mean, for instance, the filters of your air conditioner, heater or furnace, air purifier, and vacuum. In doing so, make sure you abide by the manufacturer’s instructions. Avoid using synthetic air fresheners or petroleum-based wax candles in your house. It is preferable to use homemade air fresheners and all-natural soy or beeswax candles – these do not emit hazardous chemicals. Use a humidity gauge to manage the humidity levels in your home. The best levels are around 45%. Over 50% is too humid and below 30% too dry. When it is over 50%, the humidity can cause mold to grow. You can reduce humidity by simply opening the windows (when the outdoors are not humid). You can also turn on an air conditioner, a fan, or a dehumidifier. If you want to raise the humidity levels, get a humidifier or a vaporizer. Ensure your air purifier has a HEPA (high efficiency particulate air) filter. Ensure the purifier does not emit ozone. It should also eliminate VOCs that are emitted by paint, cleaning chemicals, and furniture. Bring in some green plants to improve the quality of the air you breathe in your home. Research by NASA has shown that common indoor plants are indispensable in the purification and revitalization of indoor air. Paint using low or zero-VOC paint. Where possible, ensure the finishes and varnishes you select are not toxic. Find out the various materials that contribute to making a certain piece of furniture, and if they will offgas. In cleaning, work with cleaners and supplies that are non-toxic and eco-friendly. Alternatively, you can make your own cleaners. Reduce the number of carpets, or rather use low-pile rugs. Ensure you vacuum your house at least once every week – vacuum the carpet edges, walls, and upholstered furniture too. Wash and replace the vacuum filter often/regularly. Use a vacuum that has a HEPA filter, rotating brushes, and strong suction. You want something which can trap the minuscule allergens and particles which a regular cleaner would miss. Get a reusable microfiber dust mop. They are the best for reaching the hidden places your vacuum cannot reach. Use a damp cloth to clean the tops of doors, window sills and frames weekly. You should also wash your curtains often. Get a dust-mite-proof pillow for your bedroom. Don’t have a carpet in the bedroom. Wash the blankets and sheets weekly. Don’t leave clothes on the floor, and leave the shoes out of your bedroom. Clean and remove the mold in your shower. Fix any leaks in your roof, basement, or foundation. Leaks bring in moisture when it rains or when humidity is high, which causes mold and mildew to grow. Besides, dampness is one of the causes of coughing, wheezing, and other asthma-like symptoms. Clean up after your pet. Their urine, saliva, feces, and dead skin cells can trigger allergies. If you are sensitive to pet allergens, it’s best not to bring your pet into your bedroom. Clean your floors and the upholstered furniture at least twice a week to minimize exposure to said allergens. Ensure humidity levels and readings are below 50%. Give your upholstered furniture a vacuum and a good steam cleaning. Use covers that are dust-mite resistant, and always wash your bedding in very hot water. If there are any materials that contain asbestos in your home, check them regularly for damage. Inhaling even small quantities of this mineral fiber is enough to increase one’s potential of getting lung diseases such as lung cancer. Examples of materials that contain asbestos are shingles, roofs, flooring, and pipe coverings. Do not remove asbestos which is in place – leave it undisturbed. If you see damage in the material, either get professional help or plan for a remodel. Use exhaust fans in the bathrooms. Ensure that vents exhaust air to the outdoors rather than to other parts of the house. Get rid of any mold growth, and fix any leaks. Do not bring dry-cleaned clothes into the house before they have thoroughly air-dried outdoors. You see, dry cleaning solvents are toxic. By air-drying them out, you prevent these chemicals from interfering with the quality of your air. If the lead-based paint is in good condition, do not disturb it. Do not sand it or burn it off as this will release paint dust into the house. Ensure the areas where your children play remain dust-free. Don’t let anyone smoke in your house. Even secondhand smoke is dangerous. If one has to smoke, let them walk out and avoid creating indoor air pollution. Air cleaners for smoke can only do so much - it is much easier to remove the source. Test your home for radon. As we said earlier, radon is the leading lung cancer cause among non-smokers and the second leading cause of lung cancer in general. Estimates show that thousands die every year. The worst thing is that, being an odorless, colorless, and invisible gas, you cannot detect it physically. Only testing readings with proper sensors will can alert you of its presence. Check out our best air quality monitor for radon detection in the list above. Block holes and keep your food tightly sealed in containers. Cover trash cans, and clean off crumbs from your floors and counters. Use bait traps to catch mice and similar pests. Be wary of toxic products. Always check the labels of cleaning products, nail and hair products, hobby and art supplies, and so forth, since most of them contain VOCs. Show preference for products that are low in VOCs. When using them, open the windows and turn on the exhaust fans to keep the air fresh. A: It is a number which government agencies use to inform the public of just how polluted the air in their area currently is, or to forecast how polluted it is going to get. When AQI is high, many people in the population are likely to suffer adverse health effects. Different nations use different AQIs, depending on the particular national air quality standards of each country. For instance, Malaysia have what they call Air Pollution Index and Canada their Air Quality Health Index, whilst Singapore have the Pollutant Standards Index. In the US, the agency in charge of this matter is the United States Environmental Protection Agency (EPA). The EPA has developed an AQI which has six categories, color-coded in order of danger. The table below is a demonstration of this AQI. Our best device is the Awair Quality Monitor, which we chose mostly due to its versatility. It track carbon dioxide, chemicals, toxins, humidity and temperature. It is also a well-respected and popular product that you can use with both Apple and Android devices. hye, I am looking for a monitor including COV, but not through an app because I’m always afraid that the app bugs. the Supco don’t detect COV. do ypu have an idea ?